Would you be willing to spend approximately $75 a card for a chance to pull a once in a lifetime kind of hit that includes memorabilia-laden cards of Ty Cobb, Lou Gehrig, Jackie Robinson, Joe DiMaggio, Ted Williams, Dizzy Dean, Rogers Hornsby and Bill Dickey or autograph cards of Hall of Famers such as Ernie Banks, Johnny Bench, Stan Musial, Nolan Ryan, Yogi Berra, Frank Robinson, and Brooks Robinson? How you answer that question is the best determination of whether 2012 Panini Playoff Prime Cuts Baseball is for you. I can talk about the design, which I like, and checklist of players, which is literally too deep to fully cover, but with this box being the prime definition of our Ultra Premium Cards category, "High Risk, High Reward" for Collectors who understand that not every box will be a winner and are willing to take the chance to hit it big, there is no guess work, you are either willing to take a shot or not. At 1 pack per box, 2 cards (sometimes 3) per pack, Playoff Prime Cuts Baseball can only fit into our Ultra Premium Cards category. Here are the two cards we pulled. There are some nice design elements here. 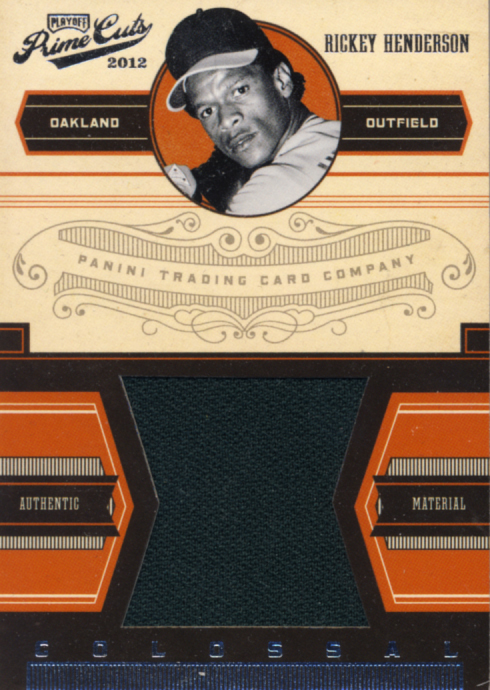 Panini has been going with the retro golden era feel with most of their Baseball products this year and I like it. There are so many different card types. The real standouts are the prime cut relic cards, especially of the amazing players of old. 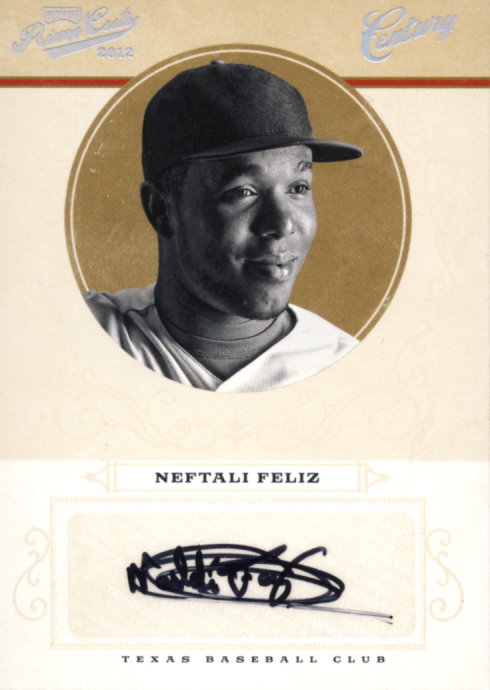 While there are a good number of on-card autograph configurations, at this level of expense, it is almost inexcusable to have a sticker autograph for a player that is still alive, let alone currently playing the game. Mind you, that is a statement from someone who does not normally have a problem with sticker autographs. As I said earlier, this is a strong checklist and the possibility of monster pulls is good. With the way this box was sealed and then was a box within a box, breaking Prime Cuts open could take longer than actually looking at the cards. The thril is mostly in the anticipation of what is contained in the box. That can quickly turn to dread the moment you break the seal, realizing there is no going back and you good get the short end of the stick. In the end, most boxes seem to be just fine, which cannot be said of all Ultra Premium Products. Hit one of those special pulls and maximum enjoyment is yours. With a full understanding of this product, collectors should be satisfied. Unless, of course, you are “one and done” and pull a rough box. That can be brutal but is part of the game. That is why, for those with deeper pockets, this is definitely a product to open by the sealed full case to spread the risk. But this will be geared more towards true collectors, not flippers looking to turn a profit. 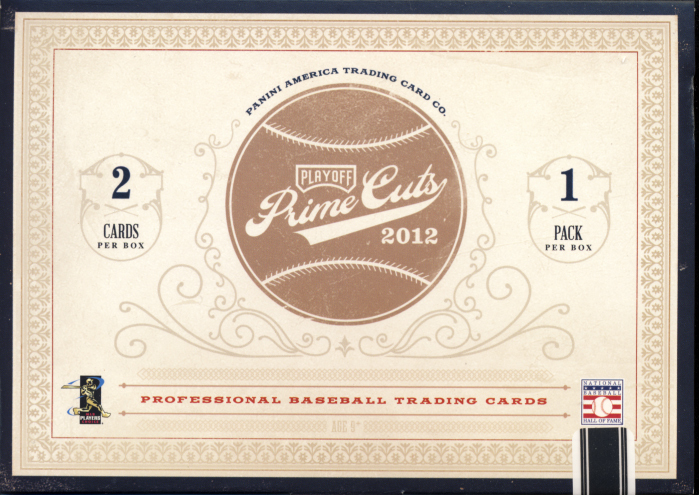 2012 Panini Playoff Prime Cuts Baseball is a huge roll of the dice, a short break but one with large upside potential. That would be a pretty tough break pulling that Feliz auto. I am a Rickey Collector, what might you need in return for his card?